Great leaders arrive at places of power because, at least in part, of their keen sense of observation. They've noticed what works, what doesn't, and what moves the needle for their teams. When you want to become this kind of thoughtful, experienced leader, self-reflection has to be a part of your daily, weekly, monthly, and yearly routines. Every day at work, you have quick interactions; you make a joke in the hallway, assign a task in a meeting, hear a complaint from an employee. Each of these moments may be insignificant in itself, but as a whole, these interactions form the total of what your employees and your management think of you. A valuable way to practice self-reflection is to use a guided journal to quickly (say, 5 minutes!) jot down what you are most proud of each day, what was out of your control, what you could have done better, and how you plan to be a better leader tomorrow. These quick bullet points actually help you to rewire your brain, selecting for the positive traits and helping you to kick negative or ineffective habits. This may also be a good time, if your self-reflection becomes repetitive, to consider what your role models do: all of us have someone whose success we aspire to emulate. Spend some time reflecting on what works for them, and experiment with whether their strategies can translate to your situation. One way to get feedback to reflect upon each week is to have your one-on-one meetings or team meetings at the end of each week. While the meeting is clearly about finding out how your team is performing, it is also deeply tied to noticing what is working and not working for your employees. 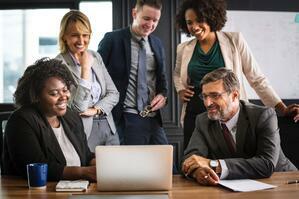 If everyone seems enthusiastic and motivated, you can reflect on what caused that success this week; if morale is lower than usual, you can also pinpoint what is going on through an effective meeting. Spend a few minutes contemplating after the meeting or meetings to consider how your behaviors can help change those circumstances for your team: is there a person in management that you have access to who might be able to help? Use your power to make your team work smoothly. Each month, we get a little "restart" that can be really helpful for catching any patterns or ruts that we've gotten into. Perhaps we've settled into a long-term strategy and aren't innovating or making data-driven decisions the way we used to; the end of the month is a time to look at every plan we have for the next month and see if there is room for change. Don't change everything every month; employees also don't love re-training and re-doing work every month. This check-in with yourself can also be about your own well-being: are you burnt out? Are you mentally checking out at work? Do you need a break? All these questions should be answered before you reach a breaking point, rather than after, so that you can appropriately schedule time off and take some "me time" or family time when it makes sense in the workflow. Your self-reflection each year should involve at least two components: first, take more time than you normally would in order to recognize successes. When something goes wrong, we tend to dwell on it, and when something goes right, many of us move on extremely quickly to the next crisis. Yearly self-reflection helps you to have a more balanced view, focusing on your successes in a way that buoys you up and helps you move into the next year excited and ready for the next challenge. Another great aspect of self-reflection at the end or beginning of a year is the chance to set some goals. Focus, at first, on things that you yourself want to accomplish, but this is also a great time to lead guided self-reflection with your team; share the goals that are relevant to them, so they can see that you are trying to improve yourself just like they are. No matter whether you are taking on your first team lead role or moving into a different C-suite role after years in management, you will gain a lot from spending time in self-reflection. Your management tasks become easier when you can identify positively what works well and remove or reduce behaviors that have less positive results. In addition, you'll likely see these other results as you become adept at self-reflection. Teams notice when you have a sense of self-reflection. A lot of complaints regarding managers involve some form of them being "clueless," unaware of important and pressing situations. By being a keen observer and thinking about your own impact on the situations in your team, you will demonstrate to your employees that you not only care, but you also plan to be a part of any solution they bring forward. As you grow in leadership, you may have to have difficult conversations about someone's job performance, for example, and genuine empathy can go a long way in such conversations. Being a good listener can be part of becoming a more self-reflective leader since you will have been paying attention to the consequences of your behaviors for a long time. Being able to honestly and fairly assess situations and still communicate clearly is all tied to seeing places for improvement in your communication style, which will happen the more you consider and reflect on your choices. Plenty of employees roll their eyes at new initiatives if they cannot see a path between the needs and vision of the company and the new work they must take on. When a great leader is paying attention and self-reflecting, the team will know that you've thought through every decision. You'll be more articulate about why last year's yearly self-reflection connects to this new weekly task, and you'll be able to show them that it will benefit the company and their careers overall. Many people who desire to lead are wanting to see themselves in a more powerful position, where they can make more of their dreams happen because of their track record of successes. Self-reflection is a big part of getting there; when you have your performance review with your manager, you can be the person who ignores advice or you can be the person who thinks it through. When you take the time to deliberately address every area of concern, you get the attention of those in power over you. They recognize you can be counted on, both for your successes and for your ability to course-correct. Those few minutes of thinking and re-thinking your actions can be what leads to that next promotion or a new job. Ready to become the best leader you can be, even when it requires taking a few long hard looks at yourself? Contact us to learn more about what we can offer to the best and brightest on your leadership team. One of the top challenges faced by Human Resources and Learning and Development Professionals across all companies in all industries - Developing Leadership. Learn how to develop your leadership team. Download our whitepaper "Great Leaders are Made Not Born." NexaLearning provides robust, dynamic learning programs that ignite the passion and productivity of your people. Our leadership and team development programs are among the highest rated in the industry. Copyright 2019 NexaLearning. All rights reserved.